Microsoft Windows has came a long way since the dreadful days of common OS crashes and BSOD's, I have been using my current install of Microsoft Windows 7 since past 2.5 years and never faced any major annoyance. Suddenly, few days ago my computer failed to connect to any shared network folder and greeted me with the error "Windows cannot access \\machine\sharedfolder, error code 0x80004005" every-time I tried accessing a network resource as shown below. Strangely, the computer was discovering other computers on the network and I was able to ping and SSH into them like my Raspberry Pi Network Attached Storage (NAS). After, trying everything from messing with firewall settings, completely uninstalling Kaspersky Internet Security 2014, enabling all sorts of networking services and changing security policies nothing worked. After 5 days of reading numerous articles on the internet I finally managed to nail this and solve this problem as shared below. 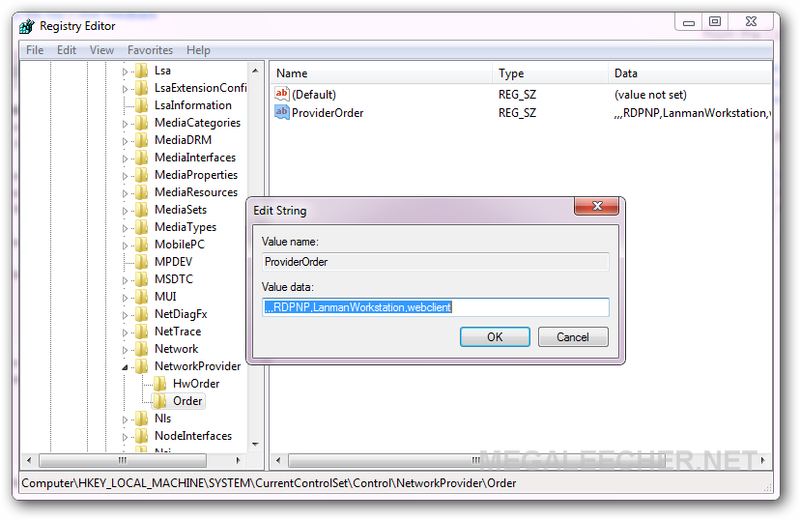 This problem occurs when Windows core networking component Multiple Provider Router (Mpr.dll) is not able to load any network providers from the registry setting located at - HKEY_LOCAL_MACHINE\SYSTEM\CurrentControlSet\Control\NetworkProvider\Order, the problem can be caused by misbehaving applications corrupting this particular registry entry. As you can see from the image posted below the 'Order' setting has two blank entries in the beginning causing the problem. 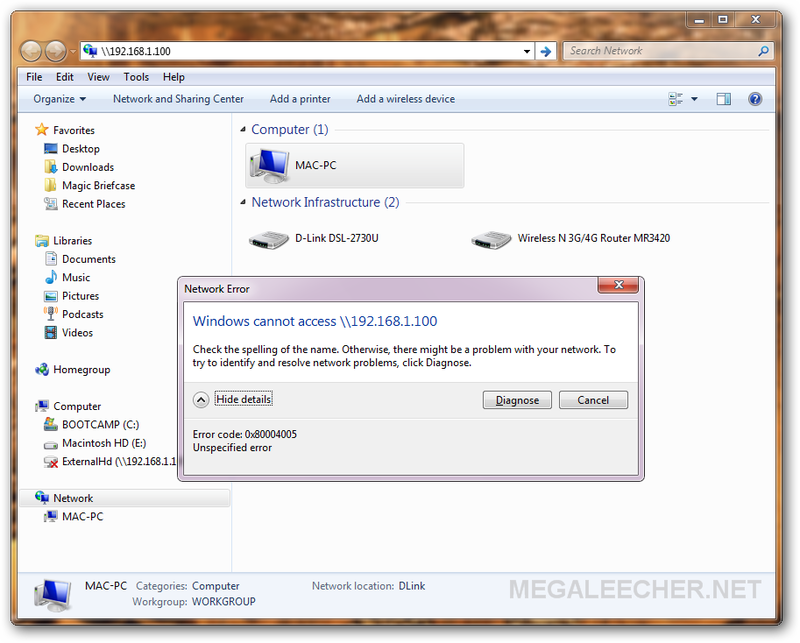 Reboot your computer and you should be able to browse the network resources as earlier. Thank you SO much. I spent hours and hours on this. Your fix was perfect! In my case the culprit was 'Akamai network whatever' which came with AutoCAD 360. But I was 98% ready to wipe out the machine just because of this. What was interesting is that any network shares that WinXP had saved in my network places were accessible. UNC paths or navigation via Network (ie: for mapping) or via view workgroup computers would not work so I was locked out of any new network connections! I don't have ",,," in the beginning and am yet seeing this problem. any concerns? Make a backup of the existing key entry and try to use just RDPNP,LanmanWorkstation,webclient, this should get it fixed for you. Actually, for all it helpe, I just used the string "RDPNP,LanmanWorkstation,webclient" without the leading the commas. It was that setting that worked as Deepish has suggested. Thanks for the tip. After finding your site, I navigated to the registry entry, and saw the only content was "WDNP32". This was caused by a recent reinstall of a program called WebDrive. I replaced "WDNP32" with "RDPNP,LanmanWorkstation,WDNP32,webclient", and my network access immediately started working. Works fine, you are te best. In our enterprise network recently started receiving the same error. 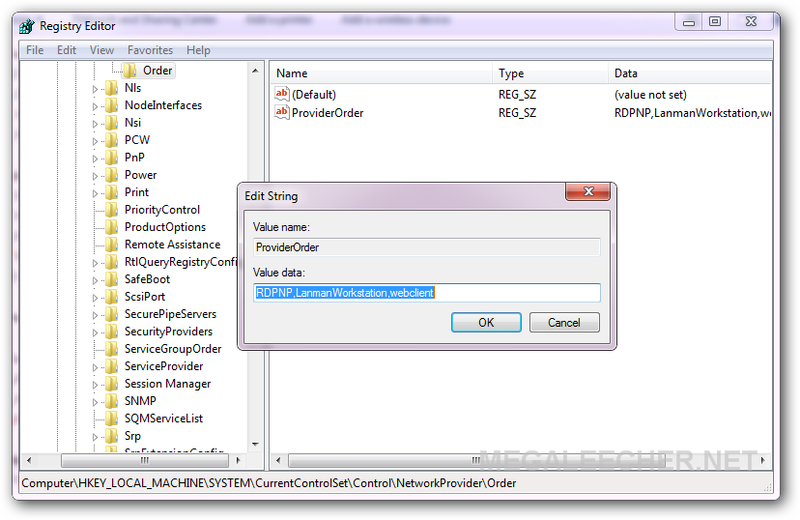 I checked registry and found as SnacNp,RDPNP,LanmanWorkstation,webclient seems it is fine. I tried removing SnacNp and changing the order of SnacNp to last. It didn't solve my problem. Strange thing is that we don't face this issue with all the shares on the same server but some of them, very random, no common thread. 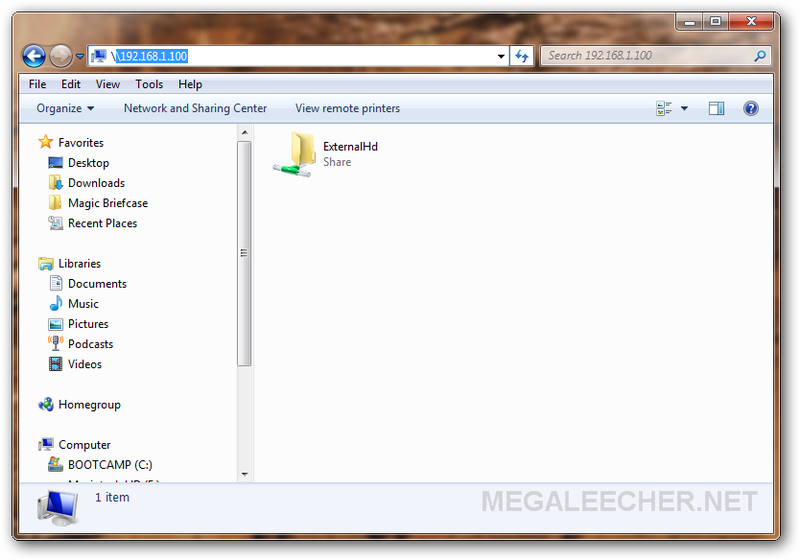 Another interesting observation is that I am able to open the Share as a Network Map Drive not directly from Hyper Link. I'd tried all the usual things that you covered, and probably read most of the same articles, but hadn't fixed my problem. I noticed 'Ofline Files' were enabled, and the status bar in Windows Explorer (bottom) was saying that I was working offline. I went into Control Panel, disabled offline files, rebooted the computer, and voilá --> I could access the shared folders again! Environment: Win 7 Ent in a 2008R2 domain. I hope this info will help someone in the same situation. i have the same problem in my organization and i dont have any commas in the registry. i don't have any idea how to solve it! This was such a frustrating problem that I spent hours and hours on. I wouldn't have figured it tout without this post. Thank you so much for sharing your solution. So grateful for your help!!! Hi. I try this but not work for me. I have external HDD attached to WiFi router. When i try to reached it (typing IP address on the "run"), show me a message "The path is not found". Same problem when i try to mapped it. I am with Win XP SP3. Any idea how to fix it? I am using Win 7 enterprise with static IP. I tried this solution but seems it was not working with my case. Is there another idea for this issue? Good man! This fixed it for me. Was so confused when I could still ping IP/name and even RDP in to desired server... I read several pages where people just gave up and reformatted or upgraded OS. This was a lifesaver. Thanks! It worked brilliantly on Windows 10 pro 64. Thank you, thank you, thank you. Diskinternals EFS Recovery had replaced the entry with "cbfsconnect2017-0".